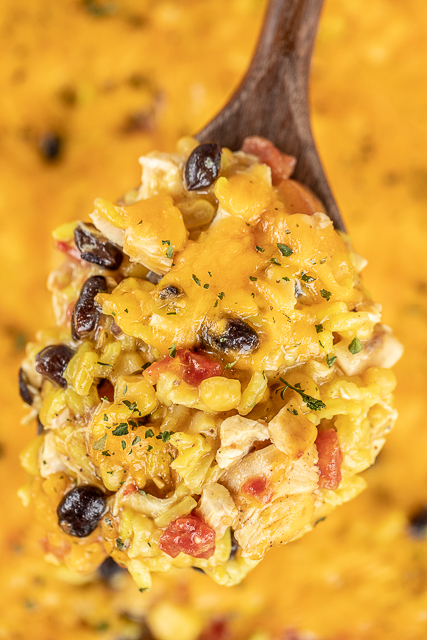 Southwestern Chicken & Yellow Rice Casserole - seriously delicious! We ate this for dinner and reheated for lunch the next day. Chicken, yellow rice, cream of chicken soup, corn, black beans, rotel diced tomatoes, and green chiles and cheese. Use a rotisserie chicken and this is ready to bake in minutes. Can make in advance and refrigerate or freeze for later. Everyone LOVES this quick and easy weeknight casserole recipe! 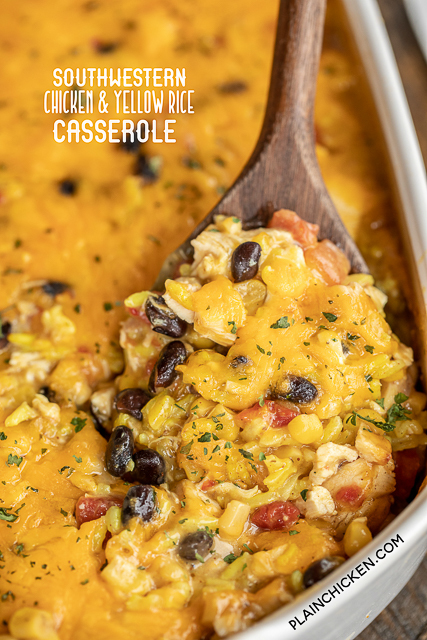 I am in LOVE with this Southwestern Chicken & Yellow Rice Casserole! It is SOOOOO good!!! I ate way too much of this yummy casserole. Chicken, yellow rice, corn, black beans, diced tomatoes and green chiles and cheese. Loaded with all of my favorites. YUM! We ate this for dinner and lunch again the next day. 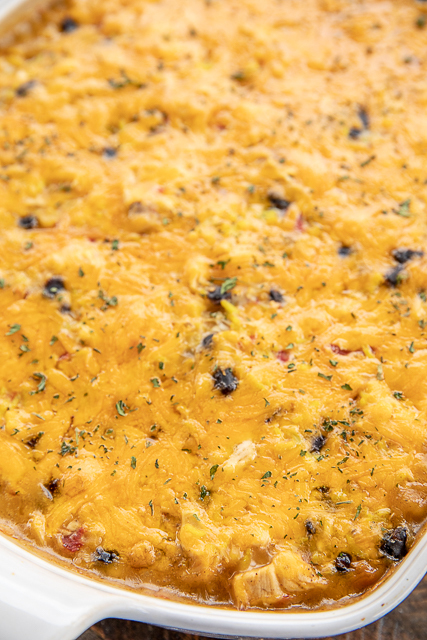 This Southwestern Chicken & Yellow Rice Casserole is very easy to make. Simply make the yellow rice and then mix everything together and spread into the baking dish. This uses Rotel diced tomatoes and green chiles. If you are worried about the heat, just make sure to buy the mild Rotel. I used a rotisserie chicken in this Southwestern Chicken & Yellow Rice Casserole and it came together in no time. 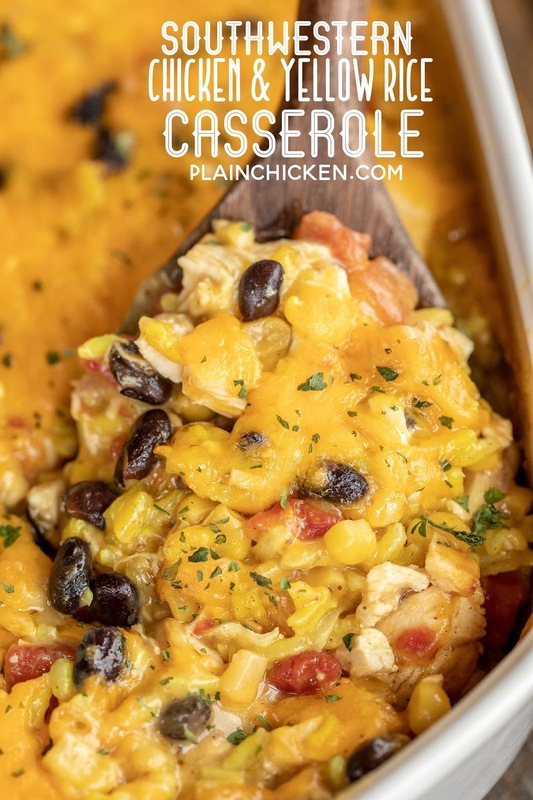 I always have some pulled rotisserie chicken in the freezer to make quick and easy casseroles like this. It is a HUGE timesaver. It is my number one time saving tip! Can I freeze this Southwestern Chicken & Yellow Rice Casserole? Absolutely! 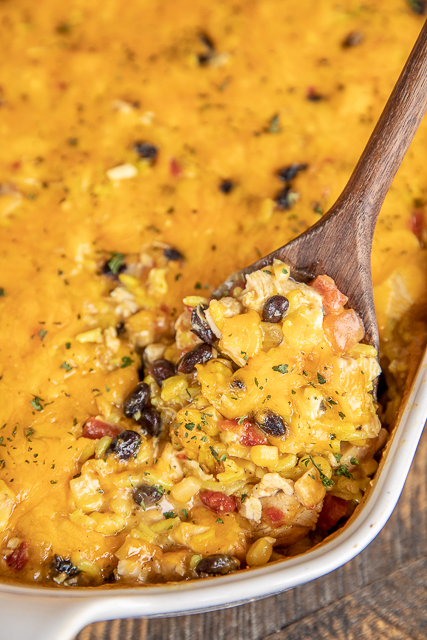 You can make this Southwestern Chicken & Yellow Rice Casserole ahead of time and refrigerate or freeze for later. You can even split this between two pans. Bake one now and freeze one unbaked for later. I love recipes that are double-duty! If you are baking this casserole after freezing, thaw the casserole completely and then bake as listed below. Mix together rice, corn, chicken, black beans, diced tomatoes and green chiles, chicken soup, taco seasoning, and 1cup cheese and soup. Season with salt and pepper, if desired. Spread into prepared pan, top with remaining 1 cup cheese. Bake for 30 to 40 minutes, until cheese is melted and bubbly. Can make in advance and refrigerate or freeze for later. Can split casserole mixture between two 9-inch pans. Do you mean tomatoes and green chilies like Rotel? "2 (10-oz) cans diced tomatoes and green tomatoes, drained"
Yes - I corrected it. looks so good and add a dollop of sour cream on top! how would you do this using brown rice?